Each year hundreds of hunting and fishing products are released into the market, but few have the chance to revolutionize or change the industry. Cabelas however has stepped it up a notch with their new ColorPhase camo product. To put it simply, this camouflage changes color based on temperature to reflect the correct color of the terrain you’re in. Mind Blown. 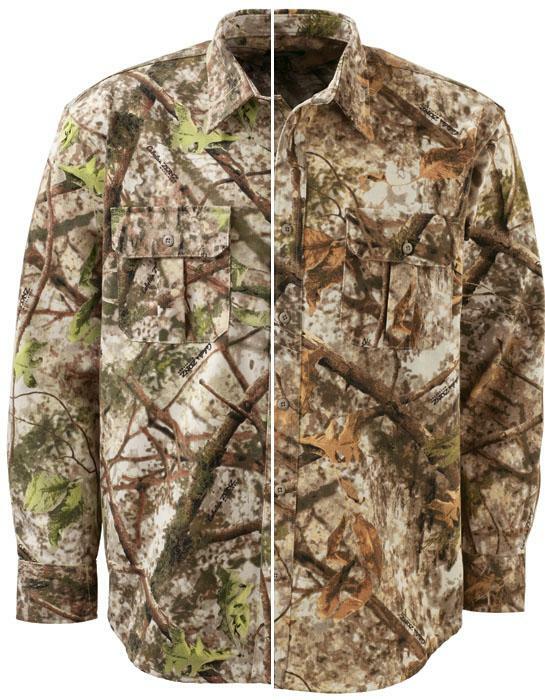 Cabelas ColorPhase Camo Technology is available in the new Cabelas Zonz camo patterns and is infused with rapid changing dyes that when the temps hit 65 degrees the shirts change colors. The browns turn to greens when it’s warmer just like the weather does and vice versa, so when you’re turkey hunting in the early season and it’s brown you can still wear the same camo four or five weeks later when the weather changes. The price is right on point with other camo clothing too. The most expensive product in the current line is an insulated jacket that is $80 but the rest of the clothing, sweatshirts, t-shirts and more are all relatively cheap. This is just the beginning and we expect this to be revolutionary and for Cabelas to do some big things with it. They own all the patents, but there will be some competitors with similar products at some point. Can you imagine a jacket that gets frosty when the temperature drops? Or snow appears on a certain temp? or it melts? Really, there are endless possibilities that we know Cabelas will do. You can find the line of Cabelas ColorPhase Camo Technology here or at www.cabelas.com.